Using advinda will enable you, as Senior Management, to stay focused on capital raising on behalf of your firm. By looking at the aggregated advinda dashboard view you always have a bird’s eye view on your campaigns’ progress without going into the details of each account. 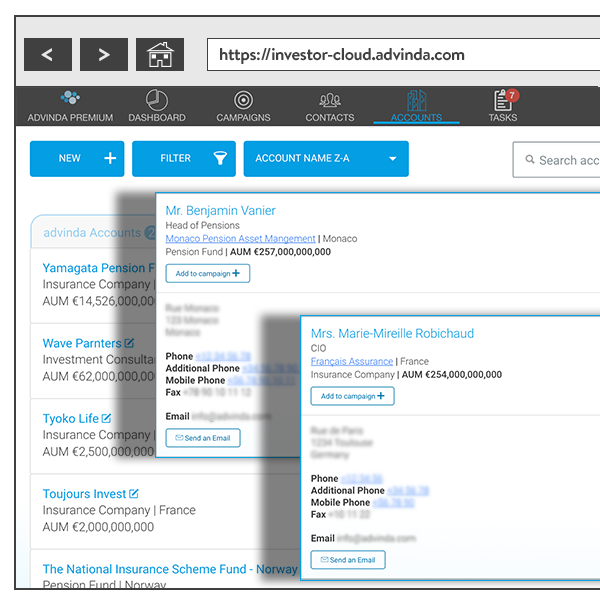 advinda’s campaign section enables you to set up campaigns, assign potentially interested LPs from your contact list and track commitment to investment. Group your campaigns by country, sales team or fund to gain insights at a glance. advinda’s dashboard view gives you a quick overview of all campaigns and their progress. The campaign cluster functionality allows you to easily group campaigns by the aggregated view you need, be it regional, by class or by team. advinda enables you to keep all fundraising activities in one place. Store your data in line with compliance and regulatory obligations, ensuring that all communications are tracked. Connect faster with relevant investment related Decision-Makers. Available as app for iOS 9 and later, Android 5.6 and later, or via web browser with the latest versions of Chrome, Firefox or Safari. 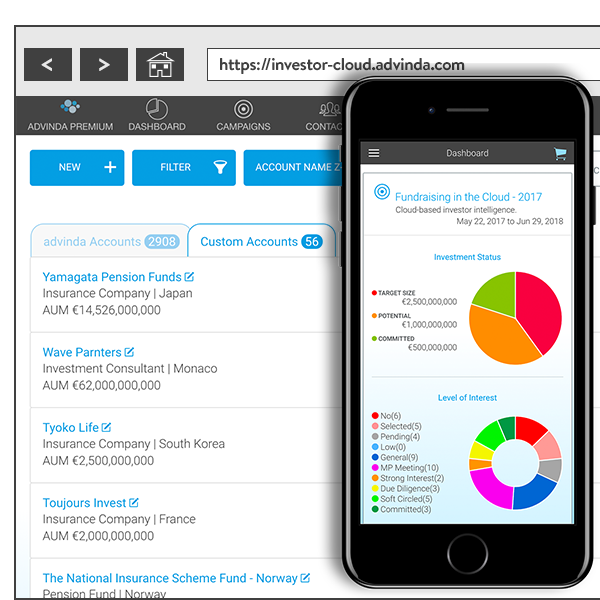 advinda Investor Cloud is a scalable, multi-tenant SaaS (software as a service) solution, built on market leading technology from Heroku, the leading Platform-as-a-Service Provider for app technology. Plus, our data is hosted with Heroku and Salesforce, the world’s leading CRM technology, ensuring near 24/7 accessibility and strong security mechanisms protecting our data and your content. advinda’s app authentication technology and user interface are constructed to restrict access to authorized data only. Plus, all access and modifications are logged. All data transfer is SSL encrypted and application behavior and availability are continuously monitored through industry-recognized solutions.